When I was growing up, I was the girl who tried every fad diet and weight-loss tip and tool in the book. From the Master cleanse, to saran-wrapping my stomach while working out (no joke), to taking laxatives like candy, I tried everything. None of it worked, surprise surprise. I grew to resent my body’s “inability” to lose weight and kept fighting it with more trends. All I wanted was to lose those elusive 5 lbs. Does this sound familiar, anyone? Cleansing in and of itself is trendy. I struggle with a lot of the cleanses out there because there is no real support for the mental and spiritual aspect of cleansing. It’s kinda just a diet that you follow and that’s it. That’s why I’ve come up with 3 tips to better support your mind and spirit while cleansing. I realize now that all the trends and fads I was doing was only putting MORE stress on my body. Constant negative self-talk triggers our stress response. When our bodies are stressed, we store fat because we think our survival is at risk, literally. So in order for a cleanse to be effective, we must be in a relaxed, stress-free environment. That’s why it’s important to practice restorative practices like yoga, walking in nature, and meditation. Pick a week that you don’t have that much going on. But maybe more importantly, come from a place of love rather than resentment. I want to be really clear with this. The kitchari cleanse I now do 2x a year is NOT a weight lose tool. It is not a one-way ticket to my happiness. In some ways, it’s actually the opposite. It’s an intense cleanse that makes you confront all those walls and habits you’ve created to distract yourself from your truth for deeper healing. It’s powerful and spiritual, and it shouldn’t be taken lightly. I’ve been in this health game for a while now. I eat clean, whole foods. Relatively speaking, I’m a bit farther along in my healing process (with a lifetime to go!). If I had tried to do the cleanse I now do two years ago, I would NOT have been able to do it. Not even close. Meet yourself where you are. Maybe you’re just starting to get curious about the whole cleanse thing. Great! Try removing gluten from your diet and see how you feel. Or try removing refined-sugar from your diet for a month. Maybe start with just drinking more water and cutting soda out. There’s no need to get crazy right off the bat. Pick a small thing, and commit to it. Every small thing will add up to a bigger and bigger goal. Slow and steady baby! Eating is extremely emotional, and personal. We all have different triggers and sentiments around food. One of the main intentions for the cleanse I do is to bring awareness to these emotions. For example. The first time I ever did a cleanse (successfully) I found myself CRAVING sweets like no other. I’m a big sweets gal, but this was a whole new level. I consulted with one of my teachers at the time about this intense craving, and she asked me the most profound question that has since altered my entire relationship with food. It struck me immediately. It seemed so simple. So obvious. At the time I was feeling extremely lonely. Even though I had a busy social calendar, I felt disconnected from the friends I had made. The sweet thing that was missing from my life was love and connection. A-ha! I had been hiding this need for deeper connection with others by over-compensating with sweets! 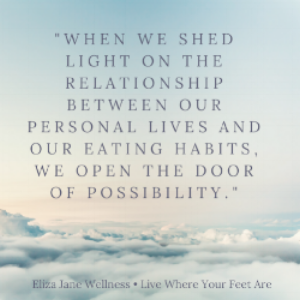 When we shed light on the relationship between our personal lives and our eating habits, we open the door of possibility. We are able to meet ourselves from a place of understanding, and then deliberately choose how we want to proceed. This is a process of mindful eating. "coming from a place of love rather than a place of hate has allowed me to nourish my body..."
All cleanses are not created equal. What works for me may not work for you, and vice versa. Cleanses are not forms of punishment, but rather a sign of love and appreciation for all the amazing things our bodies do for us. It’s counter-intuitive in a world of extreme eating habits, but coming from a place of love rather than a place of hate has allowed me to nourish my body with what it needs in the moment. Usually, that means a lot of delicious nutrient-dense food. On occasion, that means a piece of decadent chocolate cake and a glass of wine. Once in a blue moon, it means a cleanse to reset and let go of emotional eating habits that are no longer serving me. If you have any questions or need support in starting your healing journey, please email me at ejbutler5112@gmail.com.